As you can imagine, the many pristine lakes that make up Mammoth Lakes Basin and June Lake Loop are fantastic for kayaking, canoeing, and stand up paddle boarding. Or visit Mono Lake for a unique kayak tour of the tufa towers. Located at Crowley Lake Marina in Mammoth Lakes, CA. 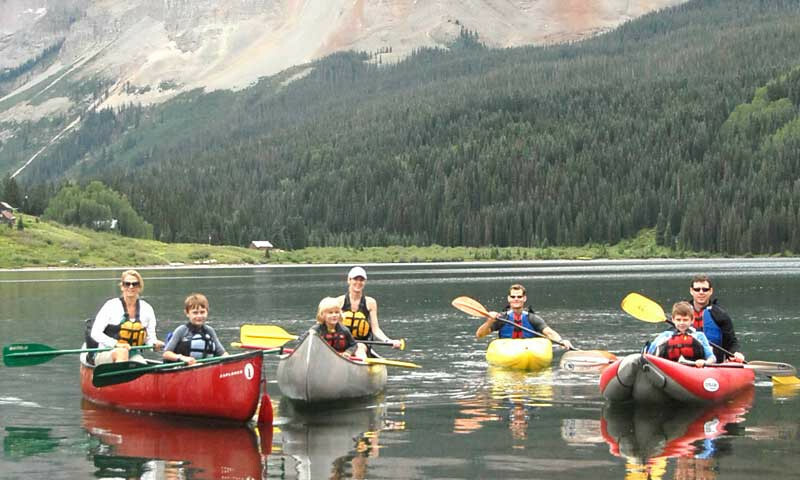 Guided kayak tours for families or singles. No prior experience is needed. Rentals and lessons. Come see us for paddleboard rentals to enjoy the waters of Mammoth Lakes and June Lake. Boat rentals and tackle shop overlooking the lake. Drive on up, and paddle out from our door. The only paddleboard and kayak rentals on the beach at June Lake. Adventure gear rental and sales specialist based in Bishop, CA. Over 20 years in the industry. Mountain bikes, kayaks, tubes and more on hand. Where should I go canoeing or kayaking? The Mammoth Lakes Basin encompasses Lake Mary, Twin Lakes, Lake George, and Lake Mamie. All of these lakes are great for kayaking and canoeing and easily accessible from town. Follow the June Lake Loop to June Lake, Gull Lake, Grant Lake and Silver Lake. Grant Lake is a reservoir that allows waterskiing and jet skiing, but its many sandy beaches and tree lined shores make a nice setting for kayaks. This large freshwater lake allows waterskiing and jet skiing but is also home to many hidden coves and beaches that are only accessible via kayak or canoe. Rentals are available at the Crowley Marina from May to October. Guided tours are also available. Paddling through the tufa towers on Mono Lake is an experience like no other. We suggest going with a guide so you can safely tour the formations and natural bird habitats. I am looking for a canoeing or kayaking guide and rentals. Marinas are located at Lake Mary, Rock Creek, Silver Lake, Gull Lake, June Lake, Grant Lake, Lake George, Convict Lake, Crowley Lake and Twin Lakes. Guided kayak trips are available on a number of the lakes and especially recommended on Mono Lake.